Karachi, Pakistan - Thousand are dead due to extreme heatwave that is happening in the country of Pakistan and might continue to rise until the heat condition on the said country will be lessen to their natural temperature. According to Anwar Kazmi of the Edhi Foundation , it can increase more and more casualties because there are still many patient are being brought to the hospital that experiencing heatstroke and dehydration. As of now the casualty nearly reaching 80,000 people were treated due to the effects of extreme heat on the said country. But according to Dr. Seemin Jamali of Jinnah Post Graduate Medical College, they expect that the casualties will no longer increase if the temperature will be begin to decrease? From 45 degrees Celsius in the past few days, its now lowered on estimated 34 degrees heat . However, medical authorities said that they will not be complacent in case that if the temperature will go back to 45 degrees Celsius? 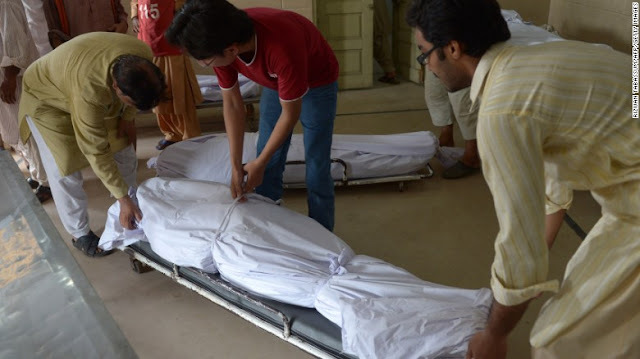 Because of the extreme heat happening in Pakistan that caused many people died, the hospital cannot accommodate all dead bodies, as they piled all dead bodies outside the city morgues which are now covered in flies. Doctors and nurses do what they can do to help all the victims of extreme heat but with limited supplies, the government-hospital is relying on volunteers and donors for even the basic necessities. The Karachi city, are used to be in experiencing high temperature but this year is so brutal that the temperature hit into 44.8 degrees Celsius. the highest-recorded temperature in the country in the last 15 years. No Comment to " Death Toll In Karachi, Pakistan Rises Into 1,000 Dead, Due To Extreme Heat Wave "